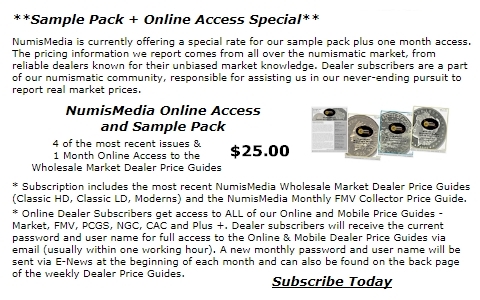 �����The heat of the market is transferring to several other series, and when this happens, it is difficult for dealers to maintain a varied inventory. As you know the metals are extremely hot and Dollars are advancing on a weekly basis. We have seen Walkers begin to move in the last month and lately we have noticed a surge in demand for Mercury Dimes and Buffalo Nickels. This may be a long year for most dealers, and we mean that in a good way. With business as active as it is, most may be thinking they will not have the time to take a vacation this year. �����Gold broke through the $1,470 mark last week and Silver was over $41. Proof Silver Eagles in the original government package are now wholesaling over $72 each. Proof Gold Eagles are trading at $1,685 with many trades even higher. The 2009 UHR is very strong at $2,550 Market in MS69. We recently posted new highs for MS65 Morgan Dollars at $180 and we have already seen dealer to dealer trades at higher levels. The rest of the Morgan series is advancing as well and so are Peace Dollars in all grades. �����In this week's HD Wholesale Market Dealer Price Guide there are many increases throughout the charts. Demand is steady to higher in most series with the Gold charts containing the most changes. Capturing a lot of attention are the $10 Indians. Better dates are strong at current levels and will trade even higher if they are problem free. The $20 Liberty series is very brisk, especially for the Type I and II dates. Better dates will trade at premiums. The 1862 S in MS63 is now at $35,250 Market. A coin you don't see too often is the 1872 CC; this week the AU58 advanced to $22,500.